Update: The Government won't call Rielle Hunter at all. It will rest tomorrow. The judge in the John Edwards trial read today's list of witnesses in court this morning. There are six, not including speechwriter Wendy Button who resumed testifying this morning. Rielle Hunter was not on the list. The Government has said it expects to wrap up its case tomorrow. The Government could, of course, call Hunter tomorrow -- even close its case with her . There would be a certain symmetry to that -- opening with Andrew Young and closing with Rielle Hunter. At the end of court Friday, the Government said it expected to wrap its case up by next Thursday. It provided the names of the next six witnesses it would call, and Rielle Hunter wasn't one of them. Alexander Forger, Bunny Mellon's lawyer, will be back on the stand Monday morning, to face cross-examination by Team Edwards. The Rielle Hunter Rehab Tour continues. The next installment: Oprah Winfrey. When? May sweeps, of course. The misunderstood mistress, who no one cares about, who only talks about herself, has chosen Oprah Winfrey over Diane Sawyer and Barbra Walters to share the next tawdry installment. The up side: Oprah's on daytime, none of us with day jobs have to worry about watching. Update: Here's a interesting profile of Rielle Hunter from her hometown magazine in Ocala, FL. Rielle Hunter, paramour of John Edwards, is telling her side of the story to GQ. The first thing I noticed is the photo spread of Hunter that accompanies the article. In two of the three photos, she's wearing no pants and her white shirt is unbuttoned suggestively. In a third, her sweatpants are loosened and untied with her now flatter belly exposed and her child on top of her. She looks like she's auditioning for a Hollywood movie. No matter what she has to say, it's going to be hard to take her seriously and impossible not to question her motives. Why is ABC so heavily promoting its segment tonight with Andrew Young, author of the sleaze book on John Edwards? I have gotten an e-mail from ABC every few hours today. Their website is filled with news and details of his appearance. So is GMA, they've been hyping it all week. I wouldn't watch Young, a self-promoting scam artist, if they paid me. Young is not an unbiased journalist. He has a past filled with transgressions, from tax liens to misdemeanor convictions. He's out to make money. He's trying to bury Edwards. I hope no one buys his book. Neil Lewis of The New York Times disappointingly mixes factual reporting and hearsay from a tabloid-type, book proposal by a dubious character in the John Edwards-Rielle Hunter drama and presents it as a news story on the grand jury investigation into the contributions Fred Baron made to Hunter from Edwards' presidential campaign fund. Ms. Hunter testified to the grand jury in detail about her relationship with Mr. Edwards, lawyers involved in the case said, as well as the benefits she was provided by his supporters after she became pregnant. Elizabeth Edwards told The Enquirer that she flipped out when she found out about Hunter's move to their neighborhood.She's always figured the child may be John's, but the positive DNA result really floored her. And as if that wasn't bad enough, John told Elizabeth he needed to be in his daughter's life - and that Rielle was moving to North Carolina. "He told Elizabeth he was tired of all the lies, and that's why he was ready to publicly admit Frances is his baby. "That's when Elizabeth exploded! In a fit of rage, she grabbed a suitcase and started packing her things . 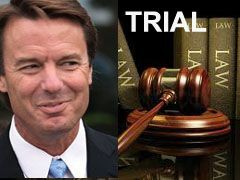 . ."
John Edwards' former lover, Rielle Hunter, spent 9 hours at the federal courthouse in Raleigh, N.C. yeterday. She brought her daughter and was escorted into the courthouse by two F.B.I. agents. Maybe she couldn't get a babysitter, but this seems a little over-the-top. Edwards, Iowa, Rumors , Denials, and What If's? I have an article at Pajamas Media today, Reframing Iowa without Edwards. It points out that the operative time period for the inquiry into the effect of an Edwards' withdrawal from the race is October, 2007, when news of his affair was first reported and he issued his first denial. The question should be what if he dropped out then? To answer it, there are other factors to consider besides second choice candidate preferences on the eve of the January 3 caucuses or during entrance polling, as others have focused on. In the end, I conclude there's no way to know what would have happened. But now, get ready for the next Edwards bombshell. The Enquirer is reporting (already picked up by the New York Post) that Edwards rekindled his affair with Rielle Hunter in 2007 -- during the time period when her baby likely was conceived. 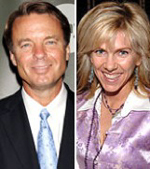 With each new detail, the John Edwards-Rielle Hunter saga continues to raise more questions than it answers. First, there's Newsweek reporter Jonathan Darman's new article about his relationship and many meetings with Rielle Hunter. She's very new age -- astrology, auras, energy fields, etc. He was covering Edwards in Iowa in 2006 when he met Rielle and they stayed in touch and met several times. Very strange story. Then, there's the real mystery man in all this: Bob McGovern. He's the guy who separately drove both Rielle and Edwards to the Beverly Hilton for their meet-up. Edwards told Nightline that McGovern was the one who called him that afternoon and asked for the meeting. Edwards also told Nightline that he only agreed to the meeting if McGovern would be there too. Rielle Hunter's ex-husband is a lawyer who is also the son of former Boulder District Attorney Alex Hunter, infamous for his handling or mishandling, depending on your view, of the JonBenet Ramsey murder. Rielle Hunter and Alexander "Kip" Munro Hunter III were married for 10 years. Here's more on Fred Baron, the Dallas lawyer and former John Edwards campaign chief who provided relocation funds (his own, not the campaign's) to Hunter and Andrew Young to relocate. Hunter also was the inspiration for the Alison Poole party-girl character in Jay McInerney's book, Story of My Life. More on Hunter here. The New York Times tries to figure out why politicians go on TV to do mea culpas. Narcissism doesn’t lead politicians to believe that they can have an affair and get away with it. It leads them to believe that they can go on television and dispel it.